Than: ‘I for joy will follow. This poem shares the treasure of meeting someone such as Dona Julieta Casimiro. She was a daughter, a mother, a sister, a grandmother, a woman of great humility, vision and prayer. 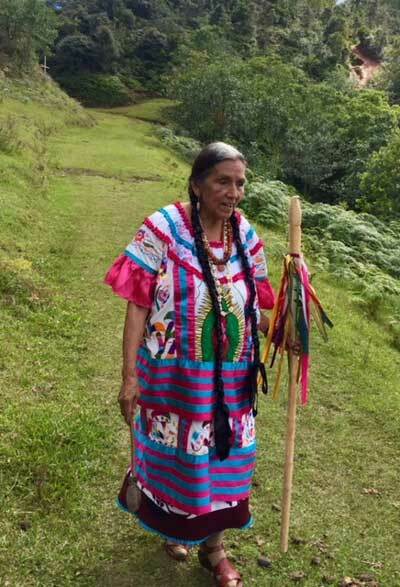 She was born in Huautla de Jiménez in 1936 into the Mazatec as a curandera and healer. She was seen as a holy woman living with her family, friends and community. Through their support and love she traveled around the world praying for peace amongst all nations. She would tell you she loved to pray and to sing the holy songs given to her by the Divine, the sacred plants and the wisdom, compassion and humility of Guadalupe. We first met her fourteen years ago. She was a small woman in physical stature that opened a portal to the Divine when she prayed. This love and the healing wisdom of the “ninos santos” touched the many and inspired the multitudes. Grandmother Julieta passed on Monday, July 23rd, at 11:20am central time. Please light a candle and hold prayers in honor of this amazing Being who walked amongst us for a short while. We are joining with your prayers calling on Divine Grace to carry her home with ease. Calling on the healing angels to embrace the family and her beloved village during this time. Her love is a good medicine and will be felt as an echo in our times. We will miss you, Dona Julieta!! Share the post "Dedication and love for Dona Julieta"